Unhappy customers….who needs them? Not! No one likes to receive a complaint, but it really is a matter of whether they arrive sooner or later. 96% of unhappy customers don’t actually complain. However, 91% of them will simply leave and never come back. Knowing this, wouldn’t you agree that a complaining customer is sometimes better than one that is silent but halfway out the door? Having unhappy customers might be a second chance in disguise. Here are some tips to help you deal with unhappy costumers. In this era of social media, people frequently turn to social networks to complain, and they can be really rude about it sometimes. What you need is the skill not to respond unkindly, because your answer may well be read by anyone. Protect your brand by being kind – always. Always remember that complaints are not personal, and that the customer’s anger is not directed to the employee, but towards the company in general. This fact will help you to remain calm and polite. If you listen with understanding & sympathy, even the angriest customer will calm down. Find out what their problem is, so you can work towards alleviating it and not towards a solution that does not actually help them in any way. The point is to resolve the customer’s issue. Before taking action, verify that what you’re doing really helps the customer by asking the customer himself/herself. Once a resolution is agreed, act quickly to implement it. All the customer really wants is a listening ear that will respect their point of view, and work towards helping them. No matter what or who caused the problem, never blame your customers (even if they have caused the issue). Making excuses is simply a waste of time, and it makes customers even more annoyed. Instead, take full responsibility and do whatever you can in your power to solve the problem as quickly as possible. Think about customer complaints as opportunities to improve your service and to transform unhappy customers into fans. 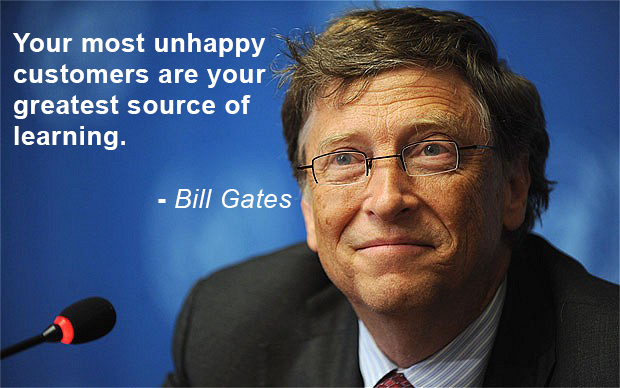 Your most unhappy customers are your greatest source of learning. Employees who handle customer service complaints quickly, efficiently and professionally take advantage of a unique opportunity: the chance to turn an unhappy customer into a satisfied customer. According to a report by White House Office of Consumer Affair, happy customers who get their issue resolved tell about 4-6 people about their experience. Not bad, right? Next time you have to deal with a disappointed customer, remember that it takes 12 positive experiences to make up for one unresolved negative experience, so believe me when I say that you do not want to miss even one chance to turn a negative experience into a positive one. We appreciate Zopim for this Original Article.